- Page arméno-arabo-chinoise en préparation - Les Mamigonians, une famille arménienne d'origine chinoise ? As of the early 20th century Armenians from both Russia and the Ottoman Empire settled in various parts of China. Many went to Manchuria (Northern China) as labourers on the Chinese Eastern Railway, which was being constructed by Russia. After the RussianJapanese War their numbers increased, particularly in Harbin, which became the center of Armenian community life, as the Armenian National Organization was founded there in 1917. Most Armenians living in Harbin, Shanghai, Tianjin, Changchun, Mukden were shopkeepers and traders. Some owned bakeries. 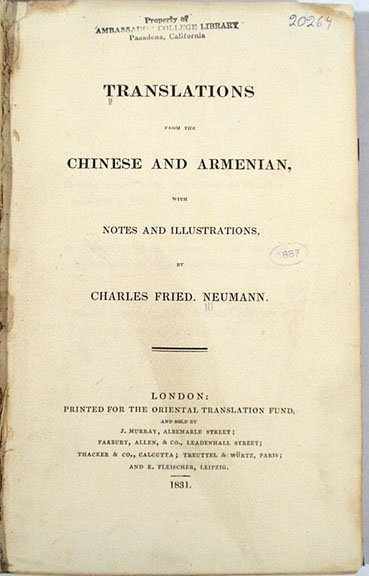 In 1918, the Chinese Eastern Railway Company granted the Armenian community a plot of land to build their Church, which was completed in 1923. In the 1960s, during the Chinese Cultural Revolution, the church was destroyed. The Board of the Armenian National Organization ran a school where Armenian language and literature were taught, social events took place and plays were staged. On national and religious holidays, tea parties were organized. In 1937 Rev. Fr. Asoghig Ghazarian was called in from Jerusalem. During WWII the Armenians were considered enemies of Japan and were jailed. Many died in concentration camps, while the survivors emigrated to different countries after the end of the war. - Le christianisme en Chine, en Tartarie et au Thibet par M. Huc ancien missionaire apostolique en Chine. Paris 1857 > Eglise construite à Han-Tcheou-Fou , ouest de la Chine, capitale de la province du Tche-Kiang . Ch.IX pages : 393.394.395.398.403. - Carte de la Chine : dans la "Mappemonde arménienne", la première carte arménienne qui fut imprimée par Mathéos Vartabed Vanadatsi à Amsterdam en 1695. - Les deux gravures sur la Chine : "Péking" et "Le fleuve Amour" de la revue arménienne "Paros Hayasdani" (Le Phare d'Arménie, Tiflis 1877).